A couple weeks ago T.J. and I flew back to South Carolina for a week of leave. The whole time we were traveling I just kept thinking how the next time I make this trip it will be with a baby in tow. So crazy to think about! Also, when that time comes I'm gonna need all the baby travel tips, k? Thanks! 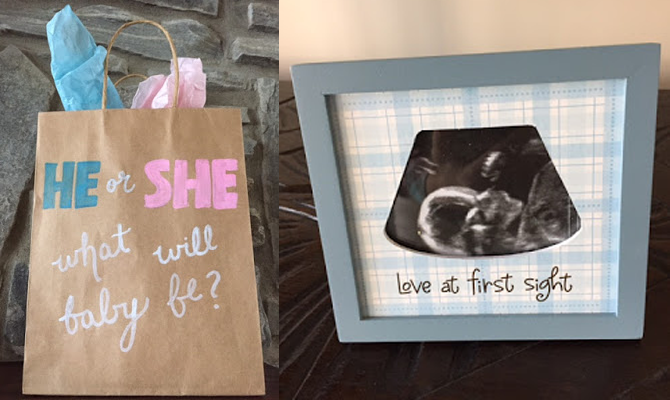 Since we had our anatomy ultrasound just a couple days before our trip we decided to keep the gender a secret until we could tell everyone in person, something we didn't get to do with our pregnancy announcement. The night we got to town we all gathered for dinner at a favorite restaurant on the lake. I had wrapped up two blue pictures frames with the ultrasound picture, one for my mom and one for his mom. Before they unwrapped them, though, we went around the table and asked everyone to guess what they thought baby would be. Most of the table said girl, and even though I was about to burst with excitement I think I managed to keep a pretty good poker face the whole time. And of course no one on team girl was disappointed to learn it's a boy! The next day my mom hosted a baby shower for me! Even though I was barely 20 weeks and that might seem a bit early for a shower, we knew I wouldn't be back in town again before baby's arrival so it was now or never and it actually worked out jut so perfectly. It was exactly the shower I always imagined. My mom went above and beyond with all the cute details and baby boy and I felt thoroughly spoiled and loved. A bunch of my family came to town along with a couple college friends, plus all of my mother-in-law's dear local friends were in attendance as well. Once guests started to arrive, before we could do anything else, we had them make their gender guesses as well and then I shared the news by opening up a box to reveal blue balloons tied around a sweet little stuffed lamb. The shower had a loose "Welcome Little Lamb" theme which everyone embraced. Luckily I think lambs are simply precious and perfect for a baby, and our little boy is now going to have a whole bin full of stuffed lambs thanks to this shower. Once everyone was in the loop we sat down to a yummy lunch. It was so fun to finally be able to gab about the baby with all the family. I hate secrets and even though I only had to keep this one for a couple days... that was enough for me. After lunch and a couple games it was present time. I really hadn't purchased anything for baby at that point (which is basically a miracle) so I was so excited for every swaddle and onesie! My one little concern about having a shower this early was that since guests wouldn't know the gender beforehand I'd end up with a bunch of gender neutral baby clothes that weren't really my style. Turns out though, most gender neutral outfits are simply perfect for a little man and I got some of the sweetest, most adorable items! That's my "oh my gosh it's so tiny!" face. Nothing makes it more real than holding teeny tiny onesies and baby booties in your hands and realizing that an actual little person, growing in my belly, is going to wear those in just a matter of months. Sidenote. 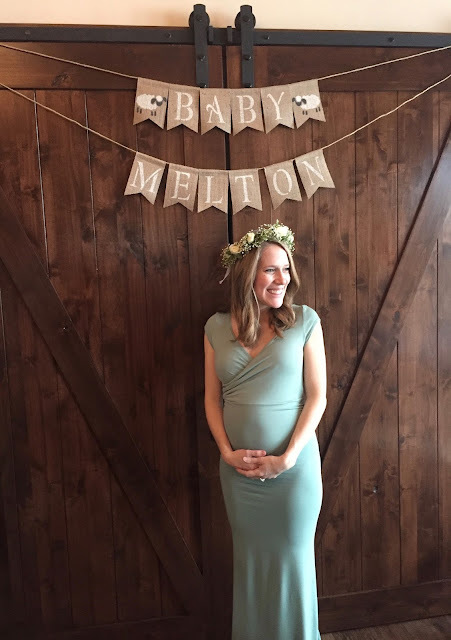 My dress is from Sew Trendy Accessories and I thought it was perfect for my shower. I was worried I wouldn't actually look pregnant since it was an earlier shower so I wanted something fitted, but of course that was a silly concern. I had it customized with on the shoulder cap sleeves rather than the off the shoulder style it came with and they cut it to length for this petite mama. I'm hoping to maybe wear it again for maternity photos if I end up doing those. My mom had made sure to note on the invitation to ship larger gifts directly to our house and I brought an extra empty suitcase with me so we were able to get all our new baby goodies home. It was so much fun unpacking everything in the nursery and having more boxes to open once we got back to Washington. Now I just need to get a dresser and tiny hangers to put all the things. T.J.'s reaction to most of gifts was "what is this for?" He'll be an expert soon enough though! Lots of fun for all. I enjoyed your mom's post with all the love and details and this one with all the love and fun!! how fun to get to celebrate baby back home!! A beautiful shower and I love your flower crown!! So sweet!!!! I don't have your phone number anymore, but if you're interested, I can send you an email with some sources for baby boy clothes that aren't totally dumb. You'll find that SO much is either sports centered or has stupid sayings on them. 🙄 But! There's great stuff out there...and I've done the legwork on where to find it. 😉 Even if your kiddo style is different from mine, I can share some good resources with you. I loved every minute of your week at home, except for the fact there were not enough minutes. See you soon! !